You love your deck. For years, it’s served as an extension of the house. During the summer, your deck is the go-to spot where guests gather. Recently, though, you were caught off guard as you glanced underneath the deck. Then you moved closer and closer to see what was living under the space. We’re willing to guess it was chipmunks, raccoons, skunks, or (gasp!) snakes. Here’s the thing: these animals find this dark area appealing because it tends to be quiet and cool. But how do you prevent unwelcome “guests” from getting cozy beneath the deck? Change whatever makes the area an appealing nest – Is there a significant amount of vegetation around your deck? Keep in mind that animals enjoy dark, dry, quiet areas. Here at Ready Decks, we recommend clearing away any overgrown plants, grass, and/or debris under the deck. Though this seems like a small thing, it will certainly let in more light and encourage the critters to leave. 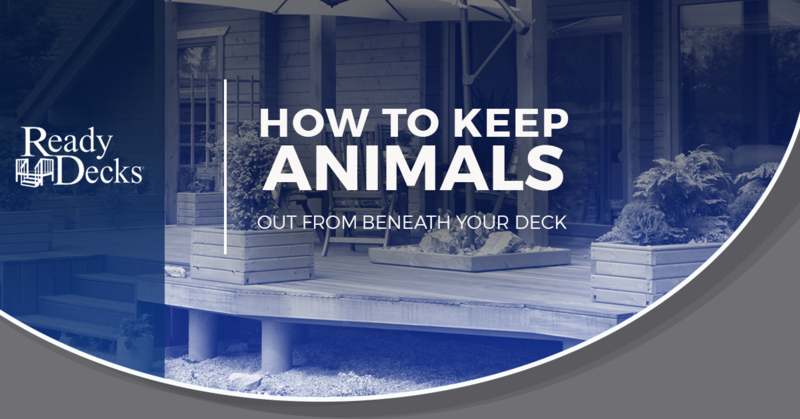 Avoid using poisons or traps – Many homeowners who want to do away with animals under their deck for good make this mistake. Sure, poisons or traps might seem appealing at first. However, these potentially dangerous products may kill non-target animals (i.e. pets) or kill an animal you can’t reach to remove. The last thing you want to do is cause yet another issue. So do yourself a favor and steer clear of poisons and traps. Consider no-dig solutions – Would you rather not dig? Then try using patio blocks to cover the opening as opposed to burying the bottom edge. Should you notice excessive moisture beneath the deck, then the blocks may not allow sufficient airflow to dry the area. As aforementioned, animals usually don’t nest in areas that are open and have a lot of light. That said, feel free to remove walls, panels, lattice, or plants that cover the area. Contact a professional – Maybe you’ve tried everything in the book but to no avail. There are plenty of wildlife removal teams who will tackle the problem in a way that’s safe, effective, and efficient. Did animals or other pests ruin your previous deck experience? The professionals at Ready Decks are paving the way for modern home improvements. Whether you’re interested in premade decks, prefab decks, or mobile home decks for sale, we have a product with your name on it. Ready Decks is so much more than just another average deck installer. For one thing, a Ready Deck is a complete deck that’s both pre-priced and custom-fit. It’s safe to say that we have something for everyone’s budget. Plus, our deck contractor can build your deck on site in just one day. No longer do homeowners have to put their life on hold for weeks at a time just because they want their own deck. Ready Decks offers homeowners an incredible value for their investment. Why go anywhere else for your decking needs? Contact our deck builder today.